Balcony with Ocean View! 2nd floor/elevator. Comfy king Bed, Hallway Bunks, Sofa Sleeper. The perfect vacation spot for couples and small families. Pet friendly. 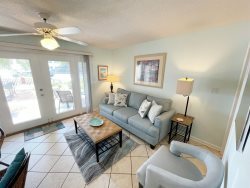 We have the perfect 1 bedroom Destin Florida condo for you! This roomy condo is just 1/2 block to the private beach and close to the north pool, tennis courts, clubhouse and fitness room. Beautiful decor. 2nd floor balcony has a view of the Gulf. Small dog pet friendly. Free wireless high-speed internet. Free Beach Service (2 Chairs & Umbrella) provided March-October. Call or book online today! Jonathan, who stayed at Maravilla 4203, a new property for Coastline Condos had this to say: "We really enjoyed our stay, great condo & management! Will definitely come back"
We are very proud to announce that we are adding Maravilla 4203 to our property management program for Spring 2017. We invite you to book your next rental with us, and stay in this condo -- 2nd floor convenience, and a great view of the Gulf! Mirrored wall enhances the water view and adds so much spaciousness to the living area. Perfect for a couple or small family, enjoy being very close to the Gulf, and a short walk to the quiet North pool. Parking is easy at building #4 -- you can park right by the elevator or stairs and be in your condo in a jiffy. Decorated in whimsical beachy decor, enjoy this condo on your next trip to Destin. You can bring your little family dog with you, as this condo is small dog pet friendly. We dont have any guest reviews yet, but we are certain they will be singing the praises of this perfect vacation spot! Book today!